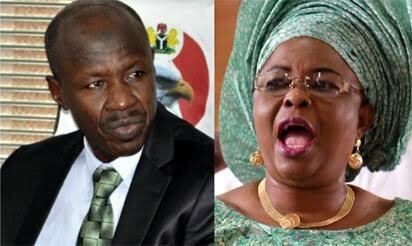 Wife of immediate former president of Nigeria, Mrs Patience Jonathan, said the acting Chairman of the Economic and Financial Crimes Commission, Mr Ibrahim Magu, wrote a letter to the British High Commission in Nigeria, asking the British Government not to issue her with a visa. According to Punch News, Patience said this in a petition written by her lawyers, Granville Abibo (SAN) & Co. which was addressed to the Speaker of the House of Representatives, Mr Yakubu Dogara. Patience said the British Government subsequently investigated her and found her not wanting and thereafter issued her with a visa. Patience said the EFCC had gone after her relatives including her older brother, Chief Aseminaso Kalama, for no just cause. Besides, Mrs Esther Oba, Patience’s relative, had also been declared a person of interest by the commission for allegedly operating a bank account with $429,381.87 (N135,255,289.05) for the former President’s wife. Patience said the Nigeria Police Force and the National Drug Law Enforcement Agency had also joined the EFCC in intimidating and harassing her family, adding that the three agencies had searched her properties at least five times. She added, “On November 3, 2016, the EFCC physically raided and attacked the premises of our client and her relations situated at 2 Igbeti Street, Maitama, Abuja, in the absence of the occupants of the house, carting away valuable items.